On our last day at Disney World, we decided to spend time at the Magic Kingdom. We knew that there were a lot of rides that you wanted to go on, but that JSL was still too small for according to Disney. One of these rides was Splash Mountain. After arriving at the park, we went to get some Fast Passes. When it was time to head back, we got a Child Swap pass so Daddy could go back on with you later. The two of us immediately went through the quickly moving Fast Pass lanes. Before we got to the area to board our log, I sent Daddy a text message. I had goofed and left my prescription sunglasses on, which made it hard to see in the darker areas of Splash Mountain. Before we knew it, they were looking for a party of two to move even further up the line. Within minutes, we were on our way to the back of a log and starting our adventure. This was not our first time on Slash Mountain together, so we knew what to expect. We just went around a corner and were heading up the giant mountain. Suddenly our log STOPPED. We were way up the incline and about 3/4 or more of the way in a pretty dark area. We sat there for a bit and then you wanted to know what was going on. I had no clue and could not get my cell phone out of my pocket. Turning around to look was next to impossible thanks to the steep incline that we were at. After about five minutes, we heard them cut into the PA system asking all cast members to immediately go to Tower 3. I have a feeling we were stuck in that area. 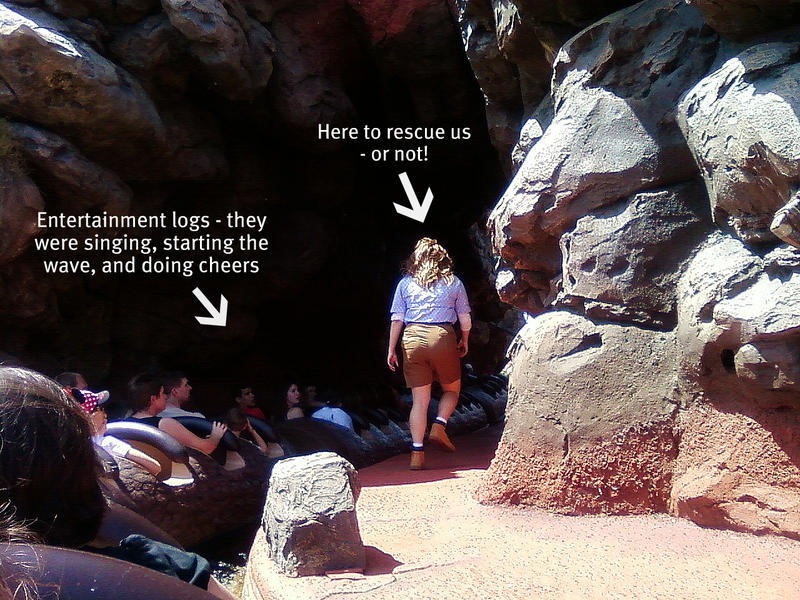 They never told us much at that point, just to stay seated and not attempt to get out of our logs. 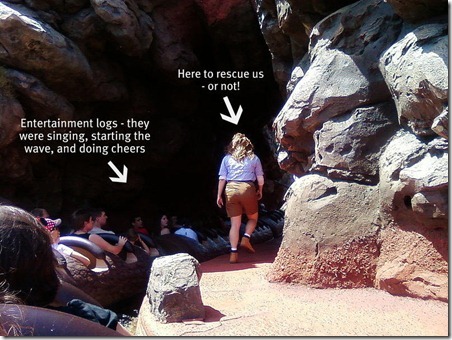 After another five minutes or so, our log started to move into the first animated section of the ride. As we left that area we were hopeful. Then we stopped again with a bunch of logs unable to move in front of us. We were baking in the sun and crowds were forming below. There were no logs going down the mountain and people knew something was up. More messages on the PA system to stay still and know they were looking into the problem. By this time, I had pulled out my phone and the two of us worked on sending photo messages and Tweets. Then, a cast member appeared along the edge of the ride. We thought perhaps that we were going to be rescued, but we were wrong. People asked what was going on, but little was said except that we would be moving soon and the ride was safe. After what seemed like an eternity, our logs moved again. 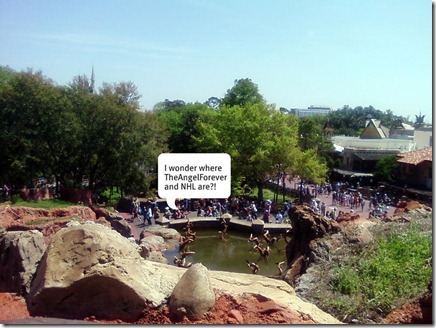 30 minutes after we started the adventure, we were able to get off the Splash Mountain. NHL, thank goodness you were there. I was shaking quite a bit and my back hurt. You led me through the maze to find our golden fast pass ticket for our trouble, and then out to Daddy. 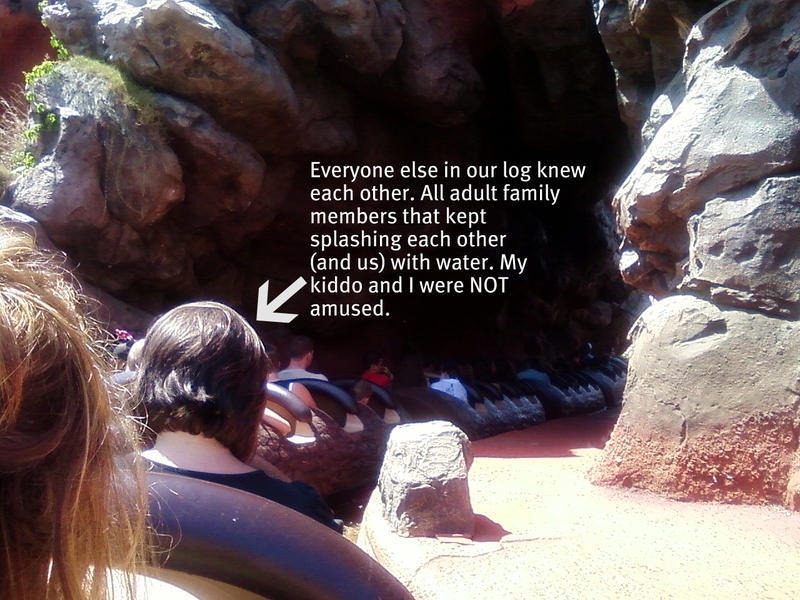 At first, you said you were never going on Splash Mountain again. 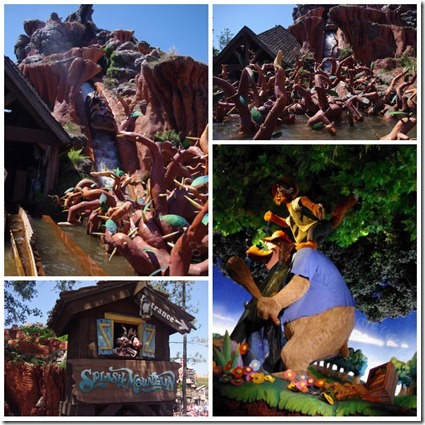 Much to my surprise, after dinner at Chef Mickey – YOU asked Daddy to go back on Splash Mountain. I was so proud of you. Thank you for being so good while we were stuck and not letting this experience ruin the magic of Splash Mountain. I love you my brave big kid. Hooray for the Big Kid!!! I’m so glad you both came through this without any emotional scars. My kids would have been the ones splashing each other! I’m glad they weren’t on the log with you. Missing WDW, you & Debra. Here’s to hoping we ALL do it again next year!! I have to admit, I probably been in one of those logs singing and being silly. No splashing though, I promise. What is a “golden fast pass”? Glad NHL was willing to get on and go again! That’s great that your son was able to get back on the ride without being scarred! Quite an adventure, after all.